Your American Pond Professional Grade Waterfall kit has been carefully packed and the items verified before shipment. A heavy duty direct drive pond pump or energy efficient magnetic hybrid pump - depending on the model you purchased. Pump sizes vary by model purchased. TIPS:Do not place directly under a tree if at all possible. The roots will make digging harder and they may eventually damage the liner. Leaves in the fall will require frequent cleanouts. TIP: Ensuring that your waterfall has plenty of water is important. Evaporation and splashing can drop the level of water in your basin quickly. One option to increase the amount of water in your basin is to fill the bottom of the basin with American Pond Basin Cubes. These heavy duty high impact resin cubes allow water to pass through but will keep out rocks. This allows you to use less rock for your basin and to add considerably to the amount of water your basin will hold. For example: One cubic foot of basin will hold 7.48 gallons of water. One cubic foot of rock filled basin will hold about 2.2 gallons of water. The American Pond Basin cubes are available from your American Pond dealer. TIP:It is important that the dirt on your waterfall area be compacted as much as possible so the least amount of settling happens. There are machines available to do this for you or you can use a weighted hand tamp which is available from almost any hardware store. Some customers will choose to simply jump up and down on the dirt on smaller projects. The pro kit the spillway will sit on top of the liner. Lay liner in a manner that will allow enough room for it to go under and up the back side of the spillway where it will attach. A check valve assembly comes with the American Pond Pro kit and includes a rubber coupler which allows you to easily remove the pump and assembly from the vault. The assembly has been hand fitted together for reference but parts will need to be glued permanently with the included PVC primer and glue. The assembly comes with lengths of PVC tubing in the assembly. To determine the best fit for your particular model waterfall kit you will attach the assembly into pump outlet at the bottom of the pump vault. Do not glue at this time! Measure the assembly and using a PVC cutter or a handsaw cut the lengths of the PVC tubing in the lengths needed for the assembly end to reach the pump vault tubing hole. Once you are satisfied with the positioning of your assembly proceed to glue each length of cut tubing into the corresponding slip fitting outlet. Using the included PVC primer and glue you will first prime the outside edge of each length of tubing as well as the inside of each plastic fitting. Once the fittings are primed you will apply glue and attach. Press the tubing firmly into the fitting and hold for about 10 seconds. The glue dries very quickly so it is recommended that you glue only one fitting at a time. TIP: Many professional pond contractors prefer slightly different configurations in their assemblies. Using the assembly parts and tubing lengths included several variations can be made. The diagram indicates only the most common assembly. The end of the assembly with rubber coupler attaches to the long section of flexible PVC tubing included with your kit. Do NOT glue the rubber coupler as this will be how your pump and assembly are removed for cleaning or winter storage. Tighten the clamp on the rubber coupler over where it attaches to the PVC tubing and your pump and assembly will be complete. American Pond brand professional medium and larger waterfall kit will include an auto fill device. This mounts to the inside of the pump vault. A connection for a garden hose or other tubing is provided. 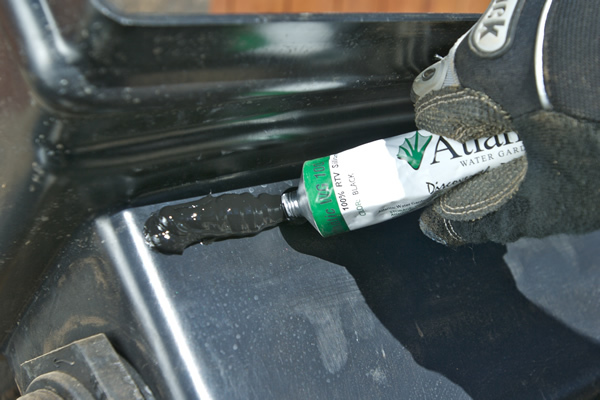 The auto fill device is an automatic control that will fill your pond basin when the water level gets too low. With its float switch and valve system the unit will also turn off the water supply once the basin is filled. If using this device you will need to make arrangements to run your water hose or tubing from your water supply to the auto fill valve in the pump vault. Burying the hose is suggested in order to keep your waterfall looking natural. Your professional waterfall kit spillway comes with a closed top that prevents water from escaping in any direction other than forward. The pro model spillway will sit directly on top of the liner. Place the spillway level from left to right to ensure a beautiful sheet of water coming from the spillway. 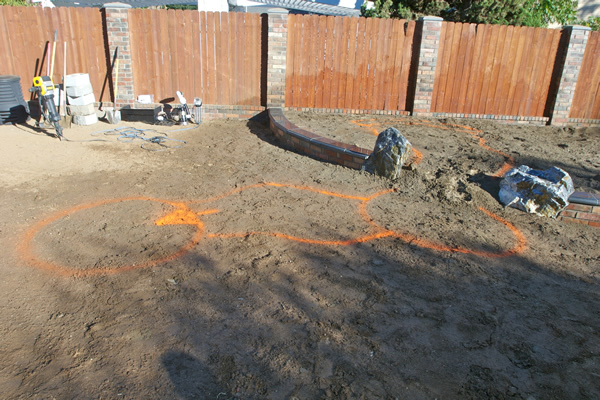 Fold back a small section of the pond liner in order to adjust the soil and compact as needed when leveling. After determining the spillway is in the ideal position and it is level remove the unit and replace the pond liner being careful not to disturb the leveled soil. 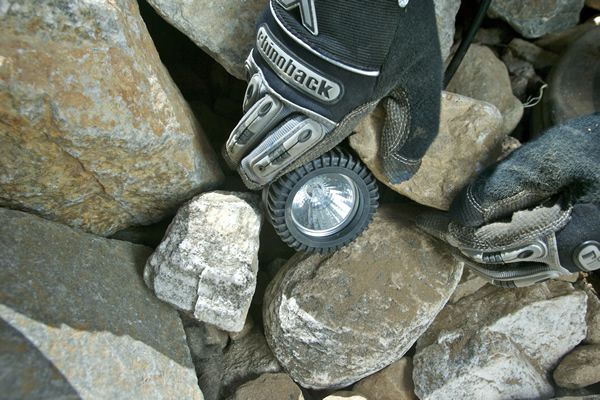 You may place 1 or 2 large stones on top of the spillway to hold it in the proper position. Place the liner up against the backside of the spillway to make sure you will have a proper fit. Do not pull tight! Leave some slack below the spillway fitting to prevent any strain or pulling on the liner connection. Make sure the liner and back of the spillway are clean of debris and lay the liner back down. 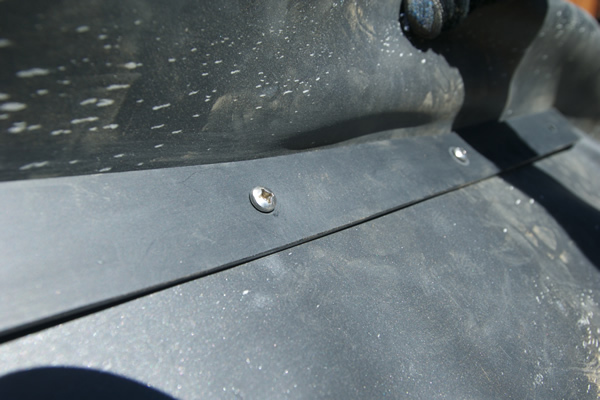 Using the included silicone sealant run a continuous bead across the circle of screw holes on the back of the spillway. Attach the circular compression fitting to the back of the spillway starting with the top screw. Use a nail or awl, if needed, to poke a hole through the liner before inserting screws. Loosely insert all screws on the compression fitting before tightening. Only tighten till the compression is snug against the liner. Over tightening can strip out the screws or crack the fitting. 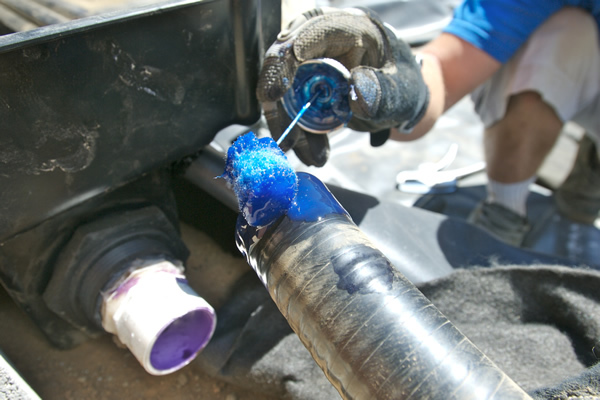 Apply a small amount of silicone sealant to the threads of the plumbing fitting and insert into the back of the spillway. Tighten with wrench to just past hand tight. Do NOT glue tubing into place at this time. 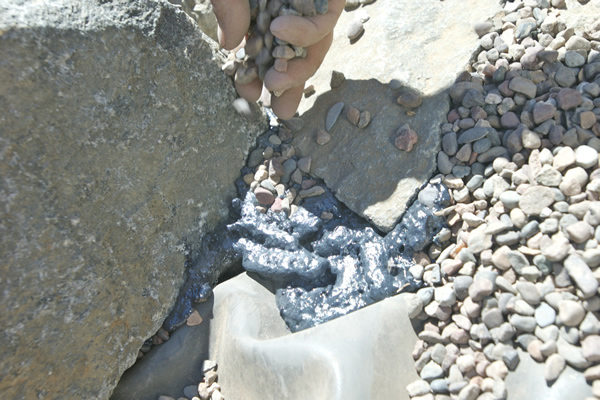 Larger rocks can be set randomly on top of the rock filled basin to create a natural look. 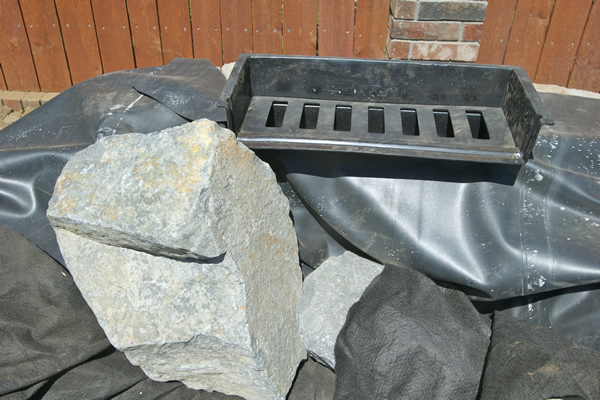 If using American Pond Basin Cubes for your structure even heavy boulders can be placed upon them for added appeal. Now is the time that you may cut off excess tubing. Just make sure you do not cut it too short and you leave a little slack in the tubing in case adjustments need to be made. When the adapter fitting is securely fastened use the PVC primer and then the PVC glue on both the inside of the adapter and the outside of your tubing. Quickly insert the tubing into the fitting and hold for about 10 seconds. With the tubing now attached backfill in behind the spillway to further help hold it in place. 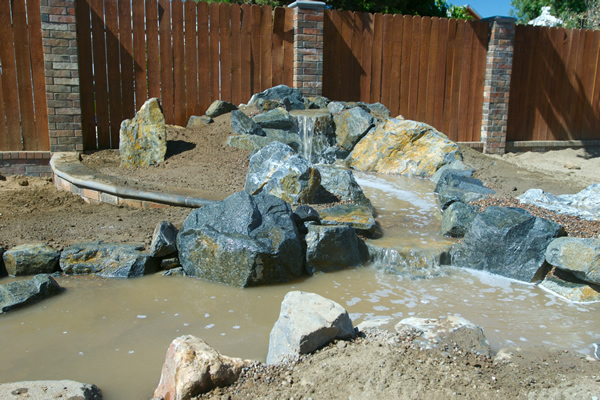 Congratulations: Your American Pond Pro-Series Pond Free Waterfall kit is now complete!